Who is "The Little Idiot" and what does he have to do with techno pop star Moby? According to the "Little Idiot Collective" website, it all began in 1982 when a 17 year old Richard Hall (aka Moby) placed a personal drawing of a simple antennaed character on every bag that left Johnny's Records. This character is who is now known as "The Little Idiot". 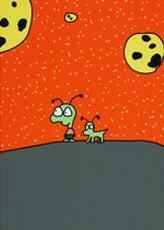 The image posted here is "boy and dog on planet" by Moby. The Little Idiot Collective is a group of cartoonists and illustrators who make t-shirts, original art, etc. In addition to Moby, the other artists in the collective are Alex Eben Meyer, BB & PPINC, Elanna Allen, Liz Baum, James Kochalka, Jamie Tanner, Marcus Randolf, Sara Varon, and Youn Lee. And, if you move fast, you can get an original Little Idiot Drawing autographed by Moby and help a good cause at the same time. CharityFolks.com has one up for auction to benefit Working Playground. The auction closes February 16, 2007. Moby is listed on page 2 of the Pop Life Art celebrity artists list.